After my morning rant, it is important to give credit where credit is due. 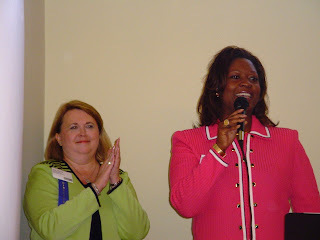 Rep. Nikki Randall has been a tireless advocate for Georgia's children during this session. It was Randall who first offered a bill to allow the state to provide stop-gap funding for PeachCare. It was Randall who took to the well virtually every day with passionate pleas to her colleagues to support PeachCare. Yesterday, she and other House members took to the well to present the minority report on HB 340. Rep. DuBose Porter, Rep. Carolyn Hugley, Rep. Calvin Smyre, Rep. Pat Gardner, Rep. Randall were among the heroes who stood up for Georgia children. They, and all the Democrats in the House who voted against HB 340 deserve our thanks. Let's give them a round of applause! Roverian Dirty Trick in the 10th? Guess Who Will Be in Macon on April 14? Will Some Democrats Bail on PeachCare? Edwards: "No Intention of Cowering in the Corner"
Can We Trust our Federal Police? Civil War in the Georgia GOP? Zell Miller: "I am Religious, and we are Right." A Fly in the Ointment?